Since ancient times, the aloe vera plant has been used around the world to treat a number of ailments. Ancient Egyptians called aloe vera “the plant of immortality,” and the Egyptian queens Cleopatra and Nefertiti used it for their skin. Native Americans referred to it as the “burn plant” or the “medicine plant,” and they used aloe vera primarily as a healing salve for burns and cuts. One of aloe vera’s most well-known benefits is its effect on skin. Some research has found that aloe vera can be topically applied to improve symptoms of psoriasis and skin rashes. One reason for this is aloe vera’s moisturizing effects; it has been shown to help bind moisture to the skin and make the skin more elastic. Good moisturizing habits are essential for self-management of conditions like psoriasis. Aloe vera gel contains vitamins A, C, and E: three key vitamins with antioxidant powers. Antioxidants help neutralize free radicals in the body, which are molecules that can cause damage to cells and tissues. This damage, which is known as oxidative stress, can increase the risk of certain diseases. One of the earliest uses of aloe vera was as a laxative. The middle layer of aloe vera (between the clear gel and the thick outer rind) contains a bitter, yellow sap that has compounds known as anthraquinones. These are natural laxatives that can increase the fluids in the intestines and improve the intestinal muscle contractions that aid in digestion. Conditions like chronic constipation and irritable bowel syndrome could benefit from the laxative effects of aloe vera. Reducing oxidative stress isn’t the only way aloe vera helps protect against illnesses. Aloe vera contains a substance called acemannan, which has been shown to have antiviral, antitumor, and immune-stimulating effects. Remarkably, some studies have found that consuming aloe vera gel may help improve cholesterol by lowering serum cholesterol, triglycerides, and total cholesterol, as well as raising HDL (“good”) cholesterol. One reason may be that aloe vera can bring the distribution of fatty acids to a normal level by controlling the metabolism of lipids in the liver. In 1935, the first report on aloe vera’s effects on skin was published. The researchers showed that extract from the plant helped relieve itching and burning from radiation dermatitis, or burns from high-energy radiation. 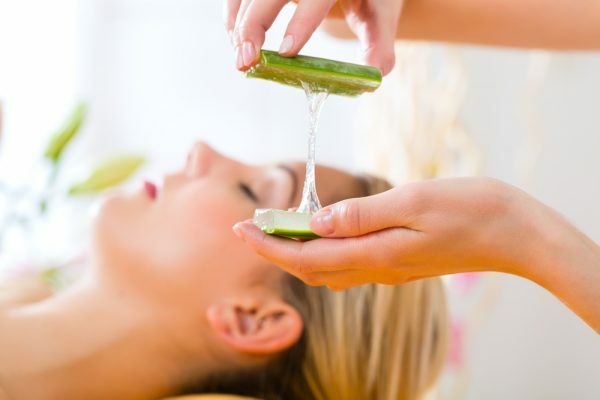 Since then, aloe vera has become widely used to treat sunburn. In fact, the U.S. Food and Drug Administration has approved the use of aloe vera-based ointment as an over-the-counter treatment for sunburns. 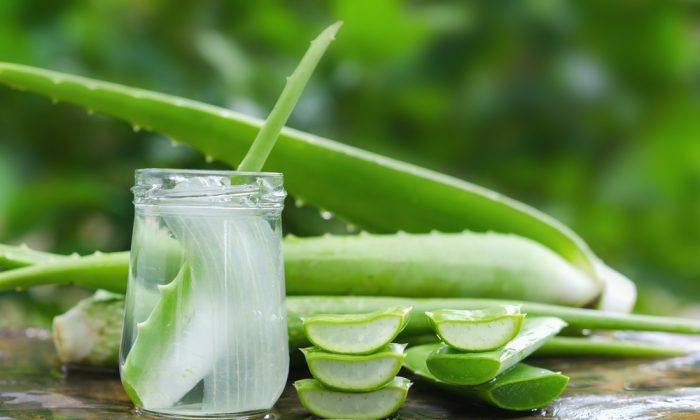 Aloe vera may also be topically applied to wounds on the skin beyond burns, such as cuts and surgical wounds. In addition to its moisturizing effect, aloe vera also helps to increase collagen production, which helps close and heal the wound faster. Aloe vera may be able to improve blood sugar levels to treat hyperglycemia, or high blood sugar. In one study of around 5,000 people with type 2 diabetes, aloe vera helped to normalize fasting and post-meal glucose levels after two months for nearly all participants. Studies indicate that this may be because aloe vera increase insulin sensitivity. Applying topical aloe vera gel to the scalp may reduce itchiness caused by dandruff, condition dry hair follicles, and promote cell growth to reduce hair loss. This is partially due to aloe vera’s moisturizing effect, as well as its vitamin and mineral content: Zinc and vitamins A, C, and E are all vital for the hair growth process, and aloe vera gel contains all of these. Although aloe vera has many useful effects, following safety recommendations is always preferred. The laxative effects of aloe vera latex may result in abdominal cramps and diarrhea, for example. 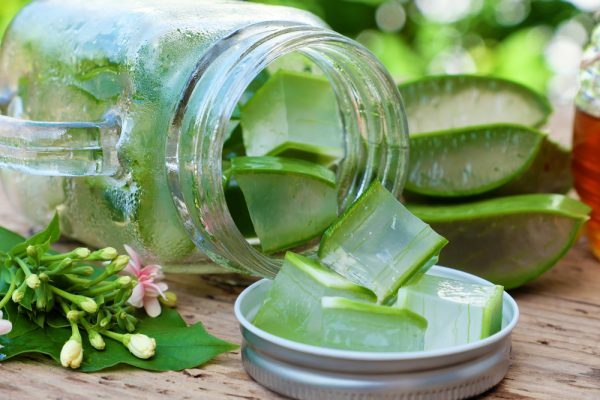 Additionally, while aloe vera may have positive effects on lowering blood sugar, people with diabetes should be careful about combining aloe vera with glucose-lowering medications: this may result in hypoglycemia, or blood sugar being too low. To enjoy the benefits of aloe vera, you have a few different options. If you do not have a green thumb, you can purchase aloe vera products from the store or online. Look for products that say “100% aloe vera gel” and do not contain a long list of other added ingredients. 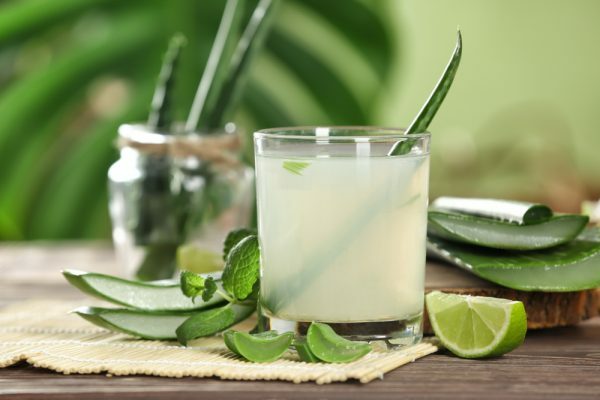 One ingredient to look out for is alcohol, which might be added to some aloe vera products to mimic the cooling effect of real aloe vera gel. However, alcohol also tends to dry out and irritate the skin, so it is better to use pure aloe vera. Alternatively, you can go the natural route and host an aloe vera plant in your home. 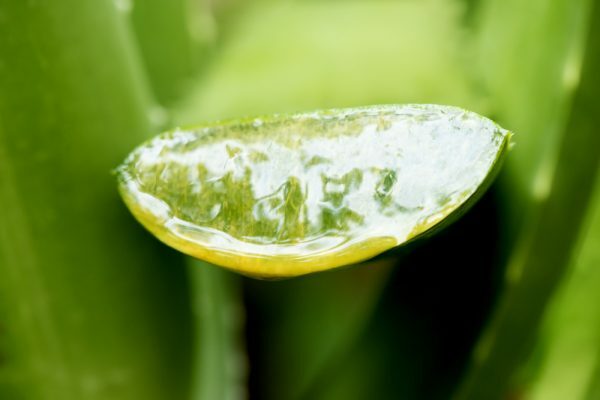 To get the inner aloe vera gel, remove a mature aloe leaf and cut it in half lengthwise. The gel can easily be squeezed out to apply topically to skin. 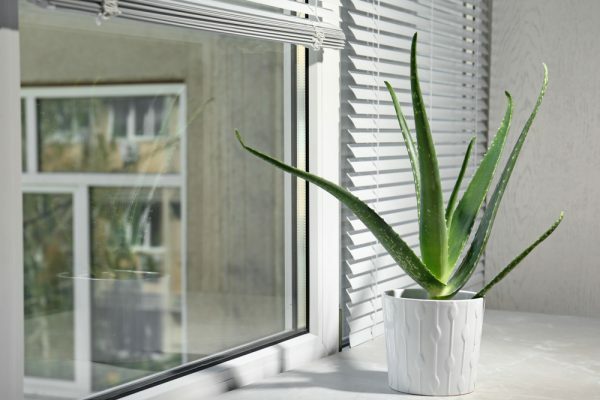 This way, the beneficial effects of aloe vera are right at your windowsill. Kristina Pentchoukova contributed to this article.